Right now you can get Angel Soft Bath Tissue for only $0.34 a double roll! See the deal scenario below. 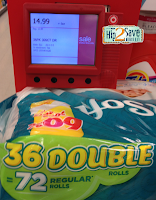 $12.24 or $0.34 per double roll after coupon and cartwheel!